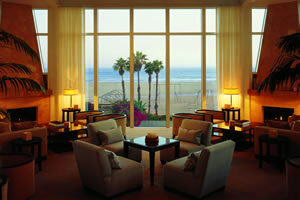 Prepare yourself for a wondrous holiday experience filled with sun, surf and sand at the Loews Santa Monica Beach Hotel, a stylish oasis where incredible natural views and vistas of the Pacific Ocean and surrounding beachfront setting combine with plenty of spacious settings, lavish comforts and an attentive level of service known throughout the Loews unique brand of hotel getaways. 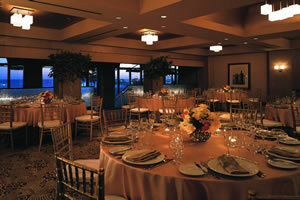 Consisting of numerous soothing and recreational facilities aimed at all ages, a number of in-house dining venues that bring the fresh flavours of California to life and a total of 347 generously spacious accommodations, the hotel is the perfect place for business or leisure travellers to enjoy the sights and sounds of Southern California. 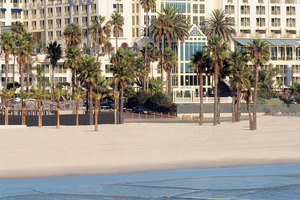 Situated in the idyllic beachfront city of Santa Monica, the Loews Santa Monica Beach Hotel brings all the sun and fun of Southern California to the fore of any holiday experience, combining the gorgeous views of the Pacific Ocean and accompanying sands with modern levels of comfort, style and service that the Loews brand is known for. 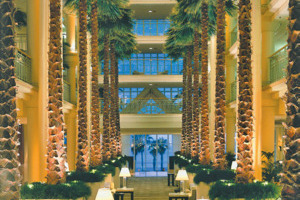 Guests of the hotel are in an ideal position to explore and uncover the wonders of the coastal city or simply enjoy the comfortable confines of the lavish hotel itself, where soothing facilities, great in-house dining venues and a total of 347 accommodations come together to make a true Los Angeles style oasis for all to enjoy. The Standard Room offers guests 30sqm of accommodation space comfortably fitted with plenty of plush furnishings, quality amenities and a modern sense of style. The room features an executive desk as well as a private balcony that showcases gorgeous external views and comes in either a king or two double bed configuration. The Ocean View Terrace Room offers guests 34sqm of accommodation space intricately designed with an abundance of comfort and style, hosting a number of lavish furnishings and quality amenities throughout. The room features a private patio that showcases views overlooking he beach and ocean and comes in either a king or two double bed configuration. The Beachcomber Fire Pit Room offers guests 34sqm of accommodation space elegantly furnished with a myriad of comforts and stylish amenities that come together to make a truly sumptuous setting. 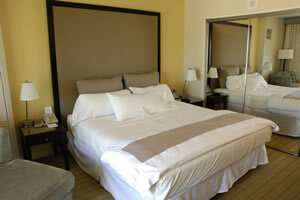 The room grants easy access to the beach and includes a furnished patio that features its own ambient fire pit. The Poolside Cabana Room offers guests 30sqm of accommodation space beautifully adorned in elegant shades of modern decor that comes perfectly accompanied by a range of lavish comforts and quality amenities to create a truly blissful setting. The room grants direct pool access, includes a furnished patio that features its own ambient fire pit and comes in either a king or two double bed configuration. The Premium Ocean View Room offers guests 34sqm of accommodation space that brings some of the greatest aspects the hotel has to offer to the fore, blending generous amounts of quality and comfort with astounding vistas. The room features an executive desk as well as a private balcony that boasts of unbelievable west-facing ocean views and comes in either a king or two double bed configuration. The Coastal View Room offers guests 34sqm of accommodation space that serves as an idyllic haven for travellers to ease back and enjoy a world full of comfort and style. 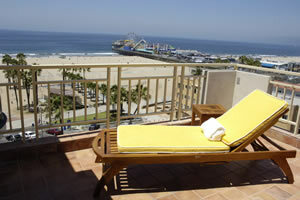 The room features an executive desk as well as a private balcony that boasts of unbelievable Santa Monica Beach views and comes in either a king or two double bed configuration. The Pacific Select Room offers guests 34sqm of accommodation space that sets the tone for a truly remarkable holiday experience, providing plenty of style, space and privacy to go with the generous amounts of comfort and quality found throughout the plush setting. The room features an executive desk as well as a private balcony that boasts of unbelievable views of the pool or Pacific Ocean and comes in either a king or two double bed configuration. The Ocean View Suite offers guests 46sqm of accommodation space that emulates the feel of a real luxurious residence, presenting a wide array of lavish comforts to accompany the elegant sense of decor. 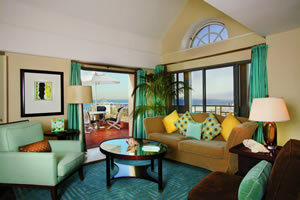 The suite features a separate living area and a private balcony that boasts of beach and ocean views. The Beachcomber Fire Pit Suite offers guests 55sqm of accommodation space located on the beach level and comes fully fitted with plenty of plush furnishings, quality amenities and an elegant sense of decor. 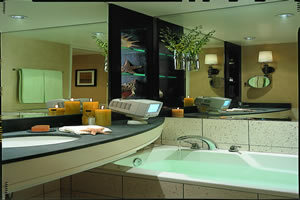 The suite grants direct beach access and features a private patio fitted with an ambient fire pit. The Bay View Terrace Suite offers guests 117sqm of accommodation space consisting of a myriad of comforts and styles that come together to create a soothing haven where travellers can ease back and unwind in peace. 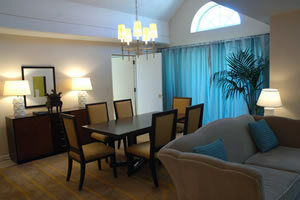 The suite features a separate living area, a dining space and includes a private patio fitted with an ambient fire pit. The Santa Monica Suite offers guests 111sqm of accommodation space whose roomy setting emulates that of a plush residence filled to the brim with lavish comforts and quality amenities all throughout. 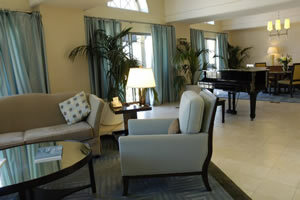 The suite features a separate living area, a dining space and includes four small private balconies that together boast of views looking out towards the Santa Monica Pier and Pacific Ocean. The Pacifica Suite offers guests 167sqm of accommodation space perfectly designed to accentuate the soothing ambiance of the surrounding setting, presenting a world of comfort and style in the form of plush furnishings and modern amenities. The suite features an open living and dining area and three private balconies that showcase gorgeous views of the Pacific Ocean. The Palm Suite offers guests 204sqm of accommodation space whose style and comforts are inspired by penthouse designs, boasting an array of lavish furnishings to accompany the generous amounts of space and quality amenities within. 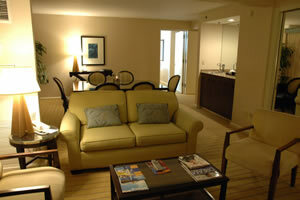 The suite features a separate living room, a dining area and a private patio fitted with an ambient fire pit. Ocean and Vine – Enjoy fresh produce and local ingredients at this retro lounge that serves up plenty of delicious Californian cuisines. Blue Streak – Ease back by the poolside or fireside of this soothing setting where sandwiches and snacks compliment views of the Pacific. 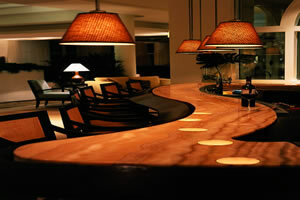 Sunrise Breakfast Bar – For those on the go, grab a tasty bite to eat or a hot or cold beverage from this early morning bar. 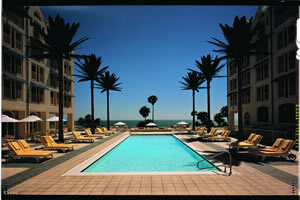 Beach Barn – Treat yourself to all your favourite flavours of ice cream or candy options at this poolside venue.